Give me a tractor, I can operate it. Sure it may take me a couple of minutes to adjust to the various brands or different models of said tractor, but I’m pretty confident in my ability to run farm machinery. Push mowers on the other hand… foreign territory. Due to the drought my lawn has been short, brown, and crunchy. As a matter of fact the last time it was mowed was early July. Since my move to Middle-of-Corn, Kansas my Dad has been the one to mow my yard. Thankfully that has only been twice. Not that I’m not incredibly grateful, but it’s over an hours drive from Water-Tower-Town, Okla., to my Kansas Hacienda, gas isn’t cheap, especially with a truck and trailer. Add in the fact he works all day then comes to my house to work more?! I promise my cooking is not worth all that effort. 5 o’clock rolled around yesterday and I left work with a mission, focused and determined to “do it myself.” I headed straight to Ace Hardware to pregame, get my head straight, and get my war face on for the task ahead. In reality I just needed a tie out chain for my dog, Oliver, but it makes me sound more intense to say I have a mowing war face… or like a goober. Whichever. Arriving home I put Oliver on his chain safely out of the way, drug the mower out into the yard, checked the oil and the gas, held the clutch in, and yanked the string. Me against the mower in a battle of stubbornness. Not willing to accept defeat, I worked and worked to bring the mower to life. 15 minutes in, and two very sore arms, I grabbed my phone and sent out a text to several friends asking what to do. It only took a couple of minutes before a call came from Kentucky. “Okay, look for the black squishy bubble by the motor,” Yoda said. (I’m thankful for friends that speak Danielle.) Finally finding the squishy bubble aka the “primer,” Yoda walked me through the rest of the process, as I pulled the string the final time and the mower fired up, I couldn’t contain my excitement as I squealed, “look at me Yoda, I’m mowing! !” “Well I’m a few hundred miles away so I can’t,” he responded. The neighbors were staring, I’d like to believe it was from my fantastic mowing skills, but it probably had something to do with my wardrobe. 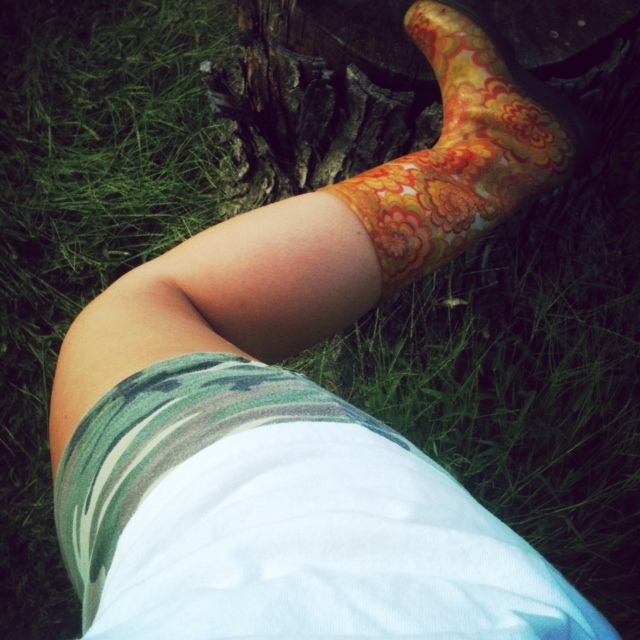 Floral print muck boots, camo shorts, and blue & white t-shirt with the sleeves ripped off showing my bright purple sports bra. Yeah I totally rocked it… maybe. My yard is roughly a half acre, so I knew it was going to take me awhile, but by the 4th lap around my spirits were soaring, I was flat out proud of myself, I had made another step in my independent ways. God has a way of always bringing me back down to Earth. It was about this time he chose to pop my pride balloon with a humble pin. The grass was thick and the ditch I was mowing inclined to sharply, making my mower bog down and quit, despite my efforts it was done for the evening. If that wasn’t enough to humble me, I looked up to see my neighbor had brought out his mower and was intently watching. Defeated and grateful, I accepted his offer. 5 minutes later he was finished with my yard and onto to mowing his own. 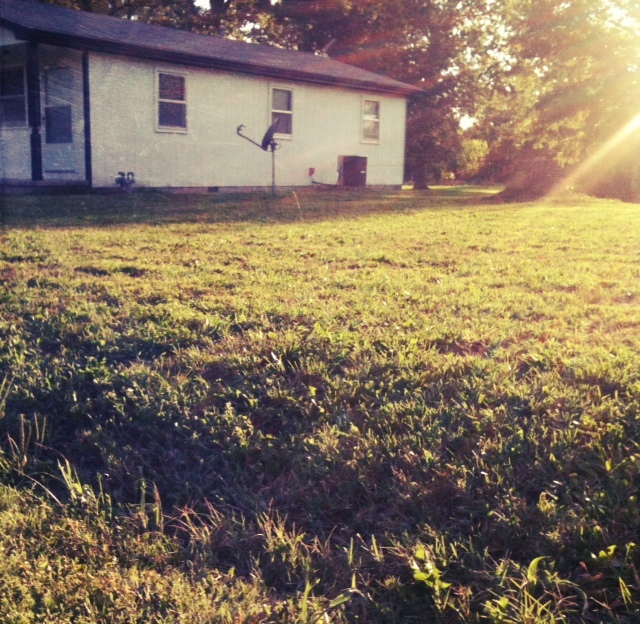 This part of my yard, I mowed… well a good portion of it. It looks like instead of singing Destiny’s Child, “Independent Woman” I’ll be baking thank you cookies for my neighbor. Oh well I celebrated my partial victory with Starbucks, because small advancements in womanhood should be rewarded with overpriced coffee… and shoes. Can I pet your cow? Danielle, You crack me up!!!! Love the story!! I love this story because I’ve totally been there before. 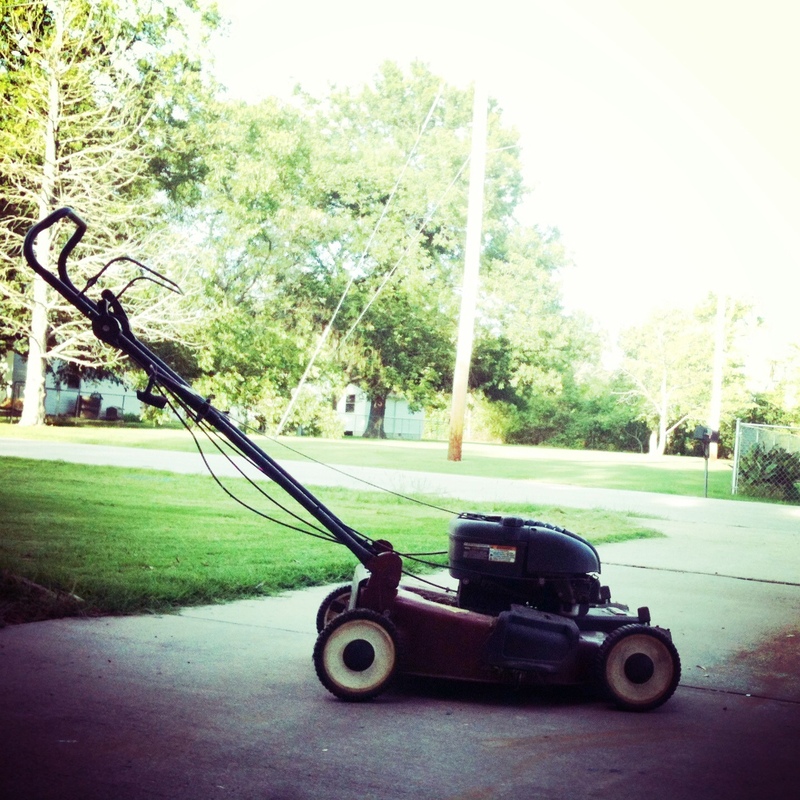 It took me several tries before I could mow with confidence and yes all the neighbor seemed to enjoy watching me “learn”…. Ok, first of all, I just started following you and I absolutely love the combination of high heels and shotgun shells as your trademark/name deal and second this post literally made me laugh out loud as I have been there before too!